Silly Jilly also performs a children's comedy magic show full of audience participation, and Silly Jilly does face painting. out how to make it awesome. Silly Jilly can be at your party any length of time from a half hour to the whole party. One way to look at figuring out how long she should be there is decide what you want (small or large balloon animals, simple or fancy face painting), and multiply the time it will take per kid by the number of kids at the party. Big and fancy balloon animals take about three and a half to four minutes to make, so if you had about thirty-two kids at your event and all you wanted was big and fancy balloon sculptures, you would have Silly Jilly at the party for two hours (3.75 minutes X 32 kids = 120 minutes). Small balloon animals and hats using about two balloons per sculpture take one to two minutes. Big and fancy balloon costumes take about four or five minutes to make and put on. Silly Jilly does not do balloons at parks afternoons mid-June through August. The face painting Silly Jilly likes to do takes about three minutes per child; however, if she takes the more complicated designs off her board, the face painting will take about two minutes per child. With both the fancy and simpler face painting, kids will choose between full-face designs and small designs. Example of full-face: tiger, pirate, or princess. Examples of small designs: flower, snake, or ladybug. The small designs are for cheeks, hands, arms, ankles and the occasional bald head. Silly Jilly can have the magic show last ten to thirty minutes. She usually has it last twenty-two to twenty-five minutes. Silly Jilly's made up name for the game is Silly Pass the Package. It is half like Hot Potato, and involves kids cheering others on. Lasts 6 to 8 minutes. She often does it at birthday parties and before her show. 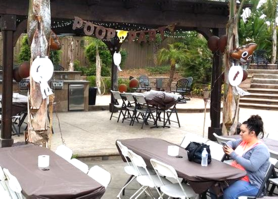 Here are some types of parties Silly Jilly has performed at. Of course Silly Jilly can perform an additional types of events and for any age. · Birthday Parties Located at a Home, Backyard, Fitz's Restaurant, Lady Bug Beads Party Room, Park, Skating Rink, Chucky Cheese, Community Center, Brentwood YMCA's Party Room, Webster YMCA's Kids' Gym, JCCA Meeting Room, Paint-Me-Pottery, Demolition Ball, Pre-School, Bowling Alley, Little Gym, Swing-Around-Funtown Party Room, and More. If your event is located in St. Louis City, St. Louis County, or Northern Jefferson County, Silly Jilly the Clown charges the below pricing, and most other St. Louis metro area locations (for example St. Charles County) are $10 more. Parties in Webster Groves, Rock Hill, Shrewsbury, and Glendale receive a $30 discount. Warson Woods, Brentwood, and Maplewood receive a $20 discount. Silly Jilly will almost travel anywhere. · $120 First Half-Hour On weekdays she has a $30 discount for plain-clothes performances. For example a one-hour performance is $170, and a two-hour performance is $270. 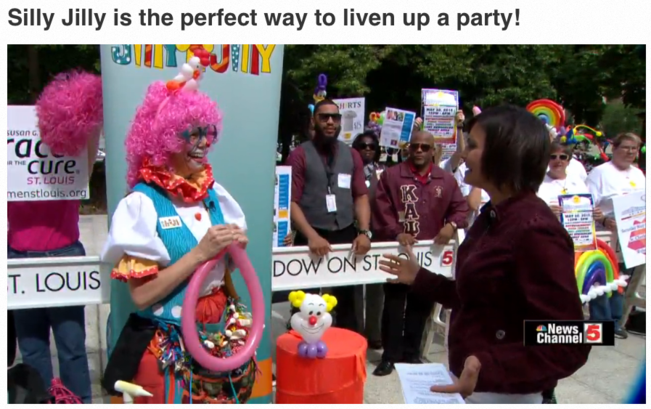 If Silly Jilly doesn't expect to have any other parties that day, she has an hour minimum when dressed as a clown; meaning most weekends she can perform for as little as a half hour and most weekdays she needs to perform for at least an hour, if you want Silly Jilly the Clown. Usually Silly Jilly will charge more for events when there are more kids than minutes she is there if doing face-painting or balloons. · "The ice cream cake won't fit in our freezer, so the kids are going to have to eat as soon as they get here." · Noisemakers are a problem. "I wish I hadn't bought those noisemakers. I was going to put them in the goodie bags, but I threw them away so the kids wouldn't torture their parents." If you give the guests noisemakers, they are all going to blow them at once, and they will keep blowing them and keep blowing them. 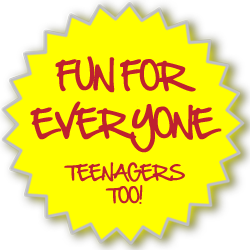 · If you don't know the names of all the kids, you may want to give them name tags. It is easier to ask a kid to behave or ask him what he wants to drink if you know his name. When the kids arrive, you could have them decorate their name tags with stickers or markers. 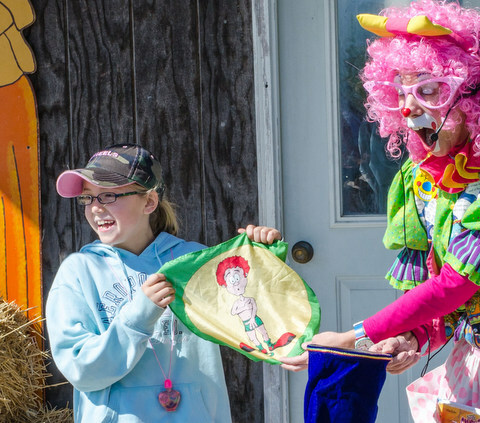 · Very occasionally there will be a child at a party who is afraid of clowns. You may want to tell the parent of the scared child to please have their child stay at the party. The scared child can watch Silly Jilly from the back of the room, and once he sees how much the other kids like Silly Jilly he'll like her too. Please give Silly Jilly at least a five minute chance to entertain the scared child. Silly Jilly has had kids cry when they first see her, and at the end of the party they want to give her a hug or are inviting her to their birthday party. · In twenty-two years, only once has a birthday child been afraid of Silly Jilly for the entire party, and he watched Silly Jilly the whole time, but from the stairs; just didn't want to come close to her. And only once has a non-birthday child been afraid of Silly Jilly for the whole time she was at the party. 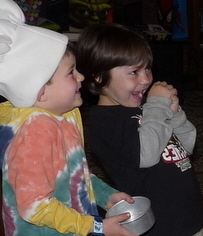 · Increase the birthday child's self-esteem by not letting him or her see you pay Silly Jilly. This way he or she may think Silly Jilly came to the birthday party just because Silly Jilly likes the birthday child. · Consider making things easy on you, and don't serve a meal. Most of the birthday parties Silly Jilly does only serve cake, ice cream, and drinks. · You may want to hide your toys because it is sometimes hard to get the kids away from the toys to participate in your planned activities. 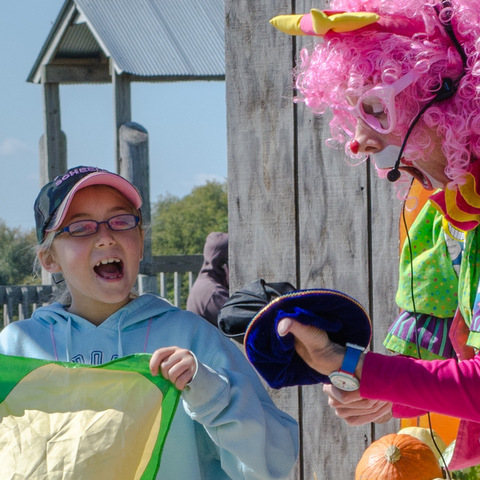 · For pinatas you don't need to blindfold the kids especially if most kids are under 8-years-old. The pinata is still challenging without the blindfold. Make sure kids don't run towards the candy when the hitter is swinging. So tell the children if it is their turn and candy comes out, don't hit it again. You may want to have two adults hold onto a rope. Ask the kids to line up behind the rope, and only hand the hitter the bat or stick after all the other kids are behind the rope. One good way to hang a pinata inside is to put a large vice in the doorway between your living and dining room. · If you have a backyard pool party, consider hiring a professional lifeguard. This way you don't have to always watch the kids, and you won't be worried. When she first gets to the party she'll make wild and crazy balloon hats for all the kids. The kids love to see their friends in the silly hats, and the hats make really cute pictures. Also, the hats serve as an icebreaker before the magic show because Silly Jilly has talked with each of the kids. After the hats, she'll do an audience participation show consisting mainly of comedy magic including spring snakes popping out of books. Silly Jilly is the magician's assistant and the audience are the magicians. The birthday child will be the star of at least one of the activities. 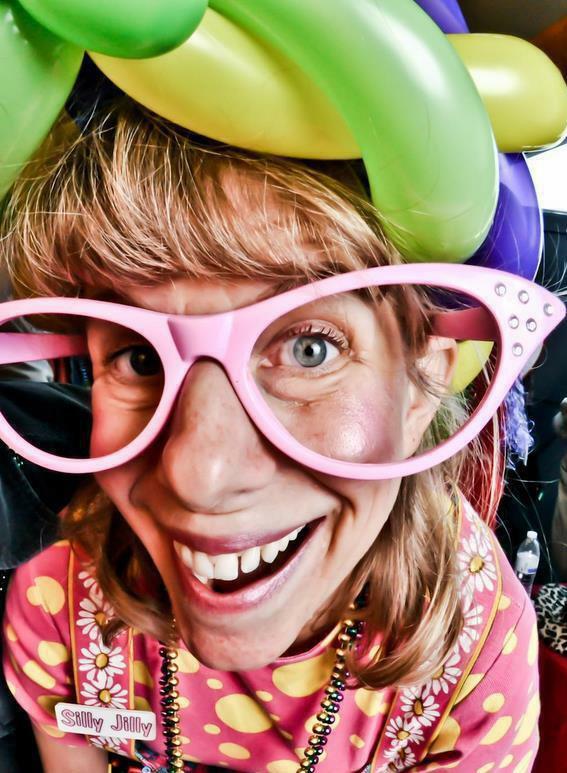 If the birthday child is not shy, Silly Jilly will have him or her on stage and helping Silly Jilly with all of the tricks, songs, or stories Silly Jilly needs helpers for. Shy birthday kids also have a great time participating in Silly Jilly's show. Kids age three to seven enjoy the show most. After the magic show Silly Jilly will start making big and fancy balloon animals, including cartoons. Your guests will be astonished at what she can create. She'll turn the balloon twisting into a game by asking the kids to try and guess what kind of balloon animal she is making and whoever guesses right will get to keep that balloon, if they want it. This usually keeps everyone's attention for about fifteen minutes, and then Silly Jilly will start taking requests. As Silly Jilly finishes up the balloons, you can either serve food, or Silly Jilly can pass out coloring pages, or the kids may be interested in watching Silly Jilly twist balloons the whole time. Would like to talk with others who hired Silly Jilly? Call Jill, (314) 968-8597, or email her, Jill@SillyJilly.com. She'll give you names and numbers of people in charge of parties Silly Jilly has preformed at recently. Reporter Tim Ezell from the Fox 2 Morning News invited Silly Jilly to his on-air thirty-third birthday party. Silly Jilly made balloon costumes for everyone including a mermaid costume for Tim. Fox 2 Morning News broadcasted from Kartoons restaurant. 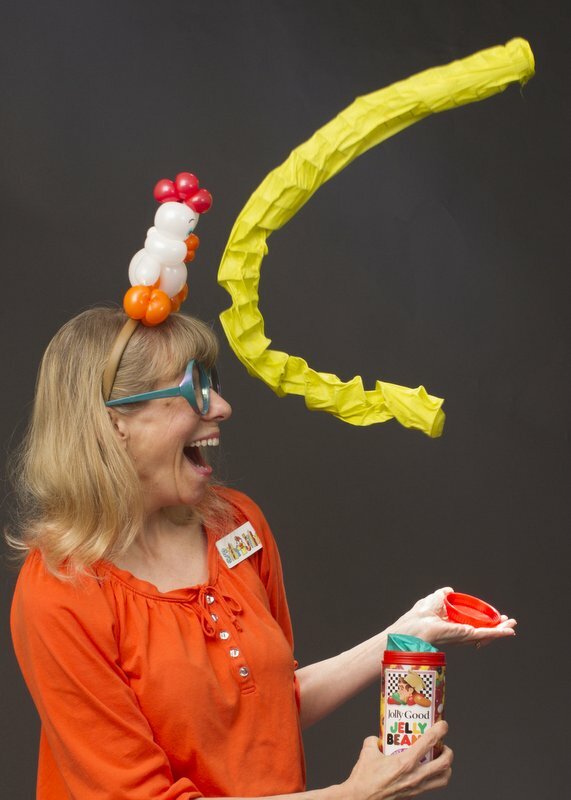 Silly Jilly spent the morning twisting balloons for the kids and did an interview with Tim Ezell. Silly Jilly turned Mariah into a fairy by making her a tiara, wings, and a flower bracelet. How Can I Become a Clown? 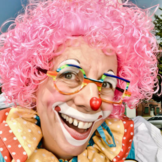 Silly Jilly started clowning by taking a clowning class through Florissant Valley Community College Continuing Education Department in 1994. So you may want to call a community college continuing education department and ask if they offer a class in clowning, or wait until you receive the class schedule in the mail. Meets at Denny's at 270 and Dorset once a month. If you would like to attend go to www.stlballoonjam.com and at the bottom of the page there is a little form you can fill out to get e-mailed monthly reminders. By joining one of these international clubs you will receive the club magazine every other month. In addition to telling you all about clowning, these magazines also advertise clown conventions where you will learn a lot about clowning. 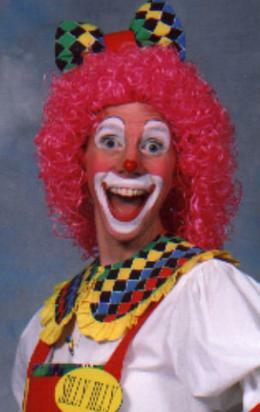 About half the weekends there is a clown convention somewhere in America. Silly Jilly could stay a shorter time if she skipped the hats or made smaller balloon animals. Silly Jilly can stay longer and do face painting, or she can stay the above amount of time and do face painting instead of balloon animals. Would Silly Jilly Do My Party for a Cheaper Price? If you want a discount you could donate to one of Silly Jilly’s favorite charities the amount Silly Jilly is charging you for the party, and if you itemize your taxes, in a way you will be paying a discounted price because the donation is tax deductible; I think. 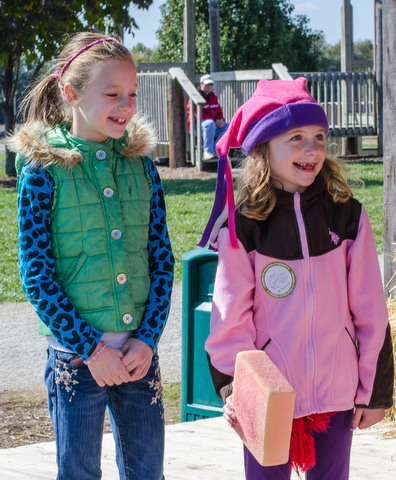 Charities Silly Jilly will accept are Girls on the Run St. Louis and any charity from TheLifeYouCanSave.org. Thinking About Having Silly Jilly at Your Fair? 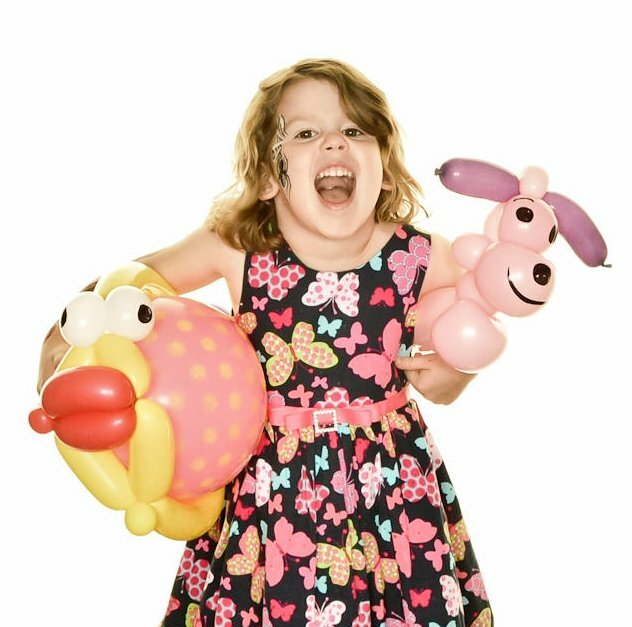 If you are having an event with hundreds of kids, Silly Jilly will (with your agreement) limit the balloon animal choices to about 10 to 15. She will might not take the time to draw on the sculptures; however, will use some printed balloons. Examples kids choose from include: giant sword, princess Elsa wand, Spiderman wand, flower bracelet, dog, and dinosaur. This will keep your line moving as Silly Jilly makes about 60 sculptures per hour. For proof click: https://youtu.be/PWbme14ohKU. She'll be talking with the kids and looking at them as she twists, and when less than six kids in line occasionally doing gags like "accidentally" letting the balloon go. The little kids think that is hilarious. 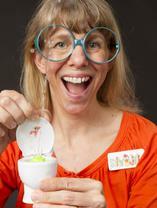 Silly Jilly is a member of the Webster Groves Shrewsbury Area Chamber of Commerce. Does Silly Jilly Take Credit Cards? Silly Jilly does not take credit cards; however, you may pay her using paypal.com and use her e-mail address of jill@sillyjilly.com. 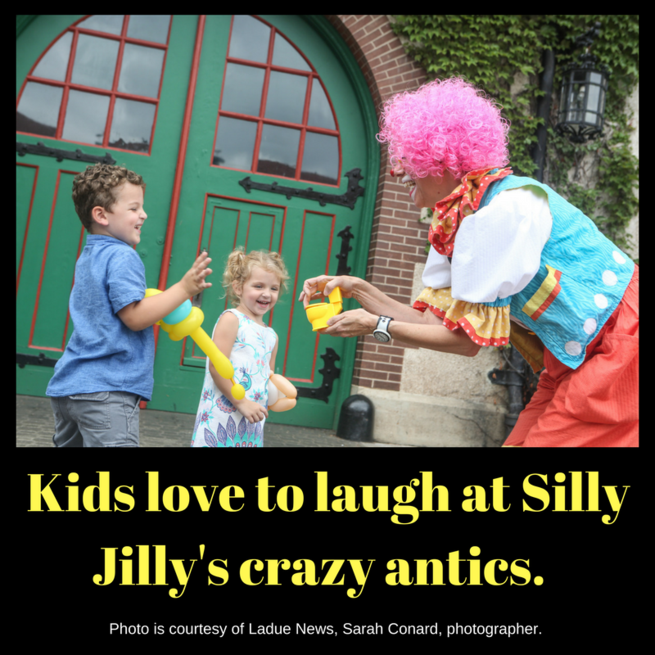 Click here to read a great 2006 Post-Dispatch article about Silly Jilly; however, it will cost you $2.95. What are Silly Jilly's Busiest Weekends? On average Silly Jilly has the most party requests for: · Saturdays of non-three day weekends in September. A four way tie for second place is: · Sundays of non-three day weekends in September, · Saturdays of non-three day weekends in May, · Saturdays in June (Especially First Sat. ), and · Saturdays in October (Especially First Sat.). The second weekend in December is also busy. Silly Jilly's busiest day of the year is often the first or second Saturday after Labor Day or Saturday after Memorial Day. She gets the least requests for January. 2. You could donate to one of Silly Jilly’s favorite charities. Pick one of the below charities and donate the price of Silly Jilly’s performance. · Any charity from thelifeyoucansave.org, for example, Against Malaria Foundation or Oxfam. 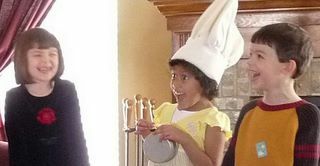 You may hand Silly Jilly a check made out to one of the organizations or donate online. Either forward your online receipt/confirmation to jill@sillyjilly.com or hand a hard copy receipt to Silly Jilly at the party. If you write a check to Girls on the Run, Silly Jilly will bring a check to the office, and if you write a check to one of the Life You Can Save charities, Silly Jilly will mail to them. If you were planning on donating to one of Silly Jilly’s favorite charities, don’t think, “I’ll book Silly Jilly and get a free party.” Please have the donation be on top of any donations you were thinking about. If you work for a company that matches your charity donations, talk with Jill if you would prefer one of the doubling charities. Silly Jilly is available almost every weekday, except Tuesday evenings because she's twisting balloons at Syberg's Chesterfield, and except Friday nights June 8 to August 2. If you don't see your date, Silly Jilly is probably available all day that day. and numbers of other good clowns. Or call or text her (314-968-8597). Silly Jilly uses Qualetex brand balloons made in Texas and Canada. Her Sharpie markers are made in the USA. degradable. They are made from the sap of rubber trees. It doesn't hurt trees; it's a harmless tapping process similar to collecting maple sap for syrup. 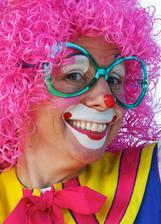 Click here for a an informative 2011 article on Silly Jilly the Clown. "Silly Jilly is top of the line! She's always busy serving St. Louis with her finest, funniest performances. She is cool, delightful, brimming with joy, and makes everyone smile. I'm so glad to know her and be her colleague. If you need a family entertainer, look no further. She rocks!" · If Silly Jilly Is on Vacation, She'll Have a Replacement. Could Silly Jilly Perform at My Party in Plain-Clothes? As long as Silly Jilly does not already have a clown party that day, she can come to your party dressed in plain-clothes. She'll probably wear colorful clothes, a silly hat and silly glasses. About 10-15% of her parties are done in plain-clothes especially from clients who know her from restaurant balloon twisting. A third dress option is to ask her to dress as Doctor Poo. Minimum or Maximum Number of Guests? No. She has had at least one party where there was only one child between the age of 2 and 16, and at this party she did her silly magic show. 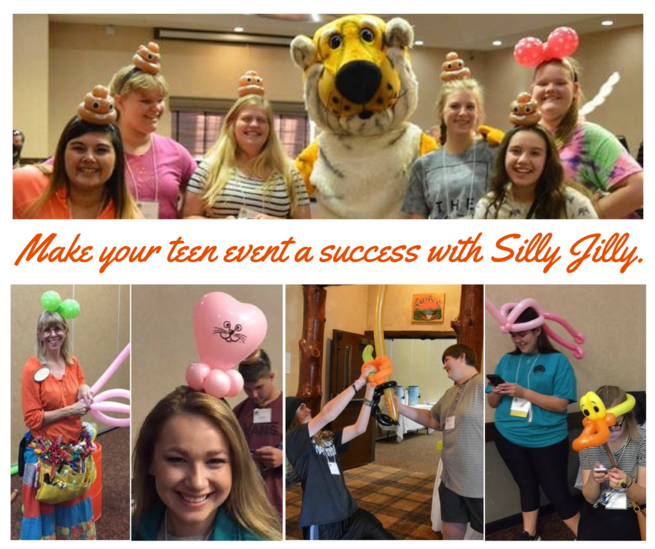 Silly Jilly has made balloons at events with thousands of kids such as the St. Louis County Fair and Air Show. She also performs a stage show for an audience of hundreds and can bring her a microphone and speaker that reaches an audience of 300. My party is located over an hour from St. Louis. Do you travel that far? Yes. 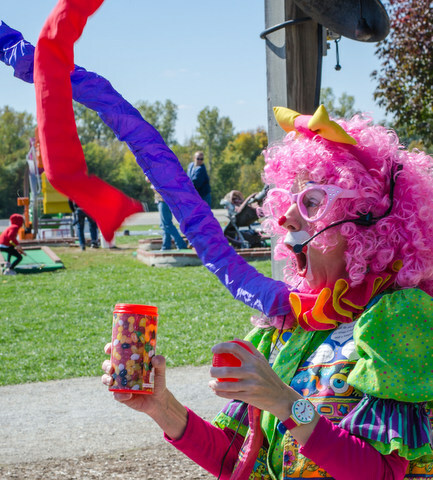 For example, Silly Jilly the Clown has performed at several Columbia, MO events, the Ste. Genevieve county fair, and birthday parties in Greenville, IL, Carlyle, IL, and Gerald, MO. She could even fly to your town. Call or e-mail for pricing. For parties located about two hours from Webster Groves (for example Cape Girardeau, Hannibal, and Springfield, IL) there is a 2 hour minimum and it is Silly Jilly's regular price plus a usual travel fee of $80 for 2 hours, $60 for 3 hours and an additional $40 for 4 or more hours. 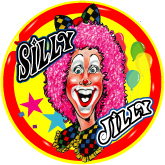 Click here for a list of where you can see Silly Jilly perform. However, it doesn't list everything. What If My Party Is Rained Out? If your party is rained out, Silly Jilly won't charge you if you call before she starts to put on her make up, or if she has another party right before yours, please call before she leaves for that first party. If she is performing in plain-clothes, just call before she leaves her house. If weather.com says there is a 30% or less chance of rain at the time of your party, you cancel your party, it does not rain, and Silly Jilly has turned down another party for that time, she would appreciate a partial payment. Sometimes clients will cancel parties when there is a 30% chance of rain (or less), and thus it usually does rain. Silly Jilly doesn't mind this on a weekday, but not on a weekend when she had turned down parties. Are you debating weather to cancel your party? For most of the parties who cancel Silly Jilly because they think it will rain, it does not rain if it is not raining when they decide to cancel, and they regret canceling or postponing their party. yahoo.com. She can offer drinks, clear finished plates, and more. With her over 10 years of waitress experience, you can count on Kim to do the things the party host doesn't have time to deal with. Keep an eye out for Silly Jilly's red Fiat 500 with yellow flowers zipping around St. Louis. The license plate is SILLY J. As a parent, inviting Silly Jilly to your child's daycare for a birthday party is popular for parents looking for an easy way to make their child feel special on their birthday. Silly Jilly's favorite radio station, KWMU, visited her at Dr. Jazz restaurant. Click below to hear. 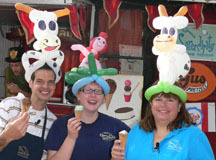 You can receive one of Silly Jilly's big and fancy balloon animals or wild and crazy balloon hats. Silly Jilly knows over two hundred balloon sculptures including monkey climbing a palm tree, penguin, ladybug, octopus, Spiderman, Angry Birds, dolphin, fish on a pole, and butterfly costume. 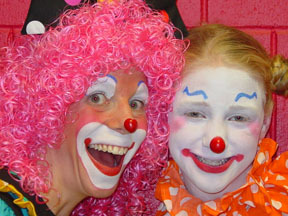 Can't decided between hiring Silly Jilly to do face-painting, magic or balloons? Silly Jilly's face-painting is mediocre and only about 20% of clients hire her for face-painting. 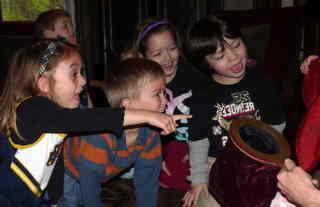 The magic show is a lot of fun (especially if there are at least five kids at the party ages three to seven.) 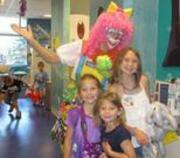 The kids will be laughing and having an amazing time throughout the twenty to twenty-five minute magic show. Studies show you'll get more happiness from spending your money on experiences than things. 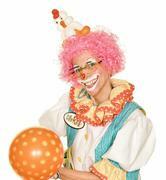 Getting a balloon from a clown and watching it being made is an experience, but not as much as a magic show. (These studies on the importance of experiences also illustrate you're smart to hire an entertainer, for example Silly Jilly, even if it means you can afford less presents.) When Silly Jilly gets compliments like, "My daughter can't stop talking about you," or "I have never seen Molly laugh so hard," or "She was so funny that we just couldn't stop laughing," this is when the kids witness Silly Jilly's non-balloon antics, for example, when Silly Jilly thinks a diaper is a beautiful hat, or the kids see her magic show. Silly Jilly's big and fancy balloons are what she's known for and popular with all ages. When she makes balloons, she talks with the child she's making the sculpture for and other children in line. Compared this to face-painting where she can't talk much to the child getting his face-painted because if the kid moves his mouth as Silly Jilly paints, the paint is messed up. 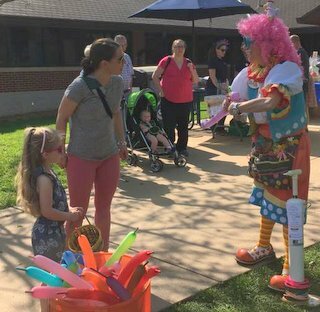 Also, it can be rude for Silly Jilly to talk with kids in line while being so close to the child getting face-painted, but not so with balloons. Sometimes fairs hire Silly Jilly for two hours to twist balloons. The maximum sculptures she could do in 2 hours is 140 and that is if she doesn't draw on the balloons and has kids choose from a short list of simple designs. The kids may spend 20 minutes waiting in line. The carnival could have instead hired Silly Jilly for a just a half-hour, and she could have entertained two hundred kids for just $120 compared to $270 to entertain less kids. 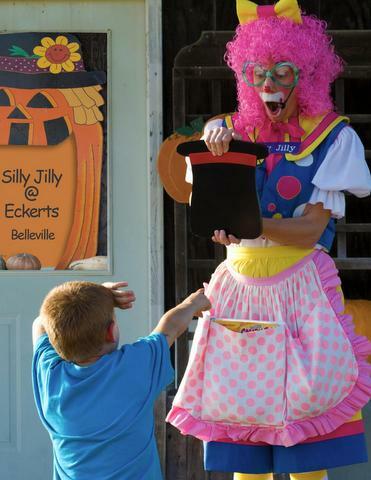 But, one advantage of balloons is all ages want one, and Silly Jilly's magic show is loved by 3 to 8-year-olds. Kids get the credit for making the magic happen. They say the magic words or wave the magic wand. For example, the whole audience shows their ability to color Silly Jilly's coloring book without crayons. So cool! Later one kid comes on stage, waves a magic chicken, and drawings appear in a previously blank coloring book. The kid did something that defies the laws of nature and prevented Silly Jilly from crying because of her broken book. Plus, the child did the amazing feat in front of his or her friends. That kid feels incredible! These three Serendipity Homemade Ice Cream fans think Silly Jilly it so funny. Silly Jilly the plain-clothes balloon artist twists balloons at Serendipity in Webster Groves most summer Mondays. Click here for a free 2008 Suburban Journals article about Silly Jilly. Click here to see an album of one of Silly Jilly's magic shows. Invite Silly Jilly to your child's princess party, and she can make everyone a tiara and princess magic wand. Then she'll have all the kids sit down, and she'll turn her balloon twisting into a game as she twists mermaids, fairies, and other princesses. 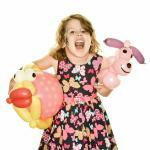 Kids think it’s hilarious when Silly Jilly “accidentally" lets the balloon go. 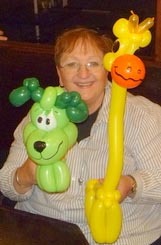 Visit Silly Jilly at Syberg's Chesterfield Tuesdays, 5:30 to 8:30, for balloon animals and laughs. 1. The toilet squirting Silly Jilly. 2. Snakes magically popping out of books and popping out of Silly Jilly’s Bag of Silliness. 3. When Silly Jilly mistakenly thought a diaper was a hat. ​ For a girl who came on stage, one of her favorite parts was, “Being the magician.” At birthday parties it is the birthday child who comes on stage. 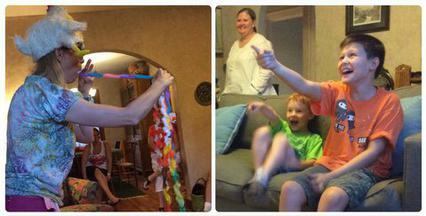 So invite Silly Jilly to your child’s birthday party, and he or she will be the star. Can I Take Photos and Videos of Silly Jilly? Absolutely, and please share them with your friend or the public. Fine with Silly Jilly if you do whatever you want with the photos or videos. A #SillyJilly is appreciated especially on Instagram. When taking photos, stand behind or to the side of Silly Jilly too, and get photos of the audience reactions. Perfect for indoor summer camps, scout meetings or any group of up to 80 people. The students learn how to make balloon animals and balloon hats, and they take their creations home. Silly Jilly blows up the balloons ahead of time (8 balloons for each student) so the class moves fast. 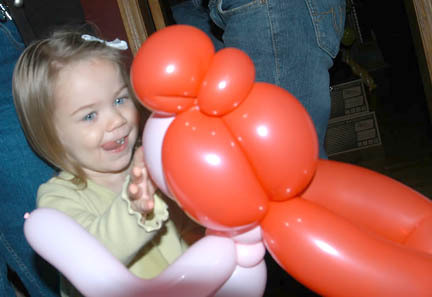 Silly Jilly remembers learning her first balloon animals then taking them home and excitedly saying, "Mom, look what I made." And that was when Silly Jilly was 28 years old. Like Silly Jilly's mom, the parents of the kids in your group will also be impressed of their proud kid's sculptures. Workshop will take around 35 to 50 minutes depending on the number and ages of the students. Call or e-mail for pricing as it is more than her regular one hour fee due to all the balloon blowing she does ahead. We had soo much FUN with u at Ste Genevieve Care Center!! thanks for entertaining us at our Holiday Open House! This is the start of an event where I'm expecting a line and have decided I'll put a maximum of 3 balloons in each sculpture. Notice the flower took me 52 seconds to make. Also notice I look and talk to the audience as I'm twisting balloons. This makes Silly Jilly more entertaining compared to balloon artists who look at their hands. These 3 Serendipity Homemade Ice Cream fans think Silly Jilly is so funny. Silly Jilly the plain-clothes balloon artist twists balloons at Serendipity ice cream in Webster Groves, most summer Monday evenings. Come join the fun. and usually allows at least an hour between her gigs. She'll be there even if she later gets a better offer. This other site is mobile friendly and lists highlights of Silly Jilly. 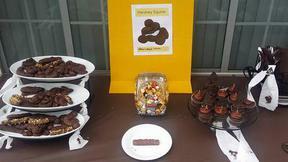 Invite Doctor Poo the balloon artist, magician and games leader to your poop theme party. 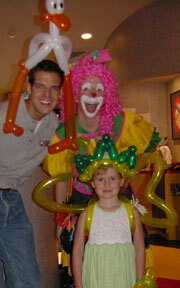 Tim Ezell from Fox2 News invited Silly Jilly to be on his show to celebrate International Balloon Month. In the previous segment Fr. Joe brought his puppet named Big Al. Silly Jilly Booked the Day of Your Party? 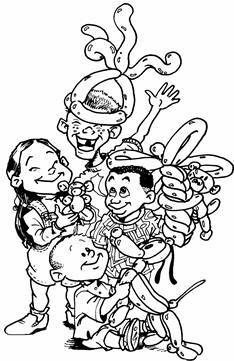 the balloon artist and children's magician. She's the St. Louis entertainer most similar to Silly Jilly. Spunkybeans is not a clown, but acts like one. 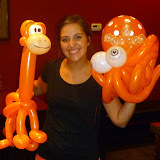 Or try Nerdy the balloon artist at 512-789-3930. Or Chef Bananas the magician at 314-666-0515. Silly Jilly's birthday party magic show is so funny. ​ For large events with hundreds of kids, it’s not about Silly Jilly showing off how fancy she can make the sculptures. 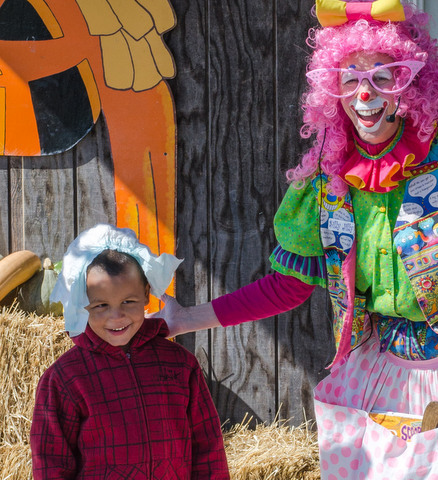 It’s about keeping the line happy, and also increases the number of kids who meet a clown. However, if you prefer, she can do the fancy balloons, for example Tweety Bird in a cage, and if there are seventeen kids in line, that seventeenth kid will wait about an hour. Or she could limit the sculptures to 3 balloons per sculpture and draw on the balloons, and with this option the seventeenth kid in line would wait about 40 minutes. With the first option (like the boy pictured with the bunny bracelet, carrot, and giant sword who waited in line three times) the seventeenth kid in line will wait about 15 minutes. I do not do balloon decor. 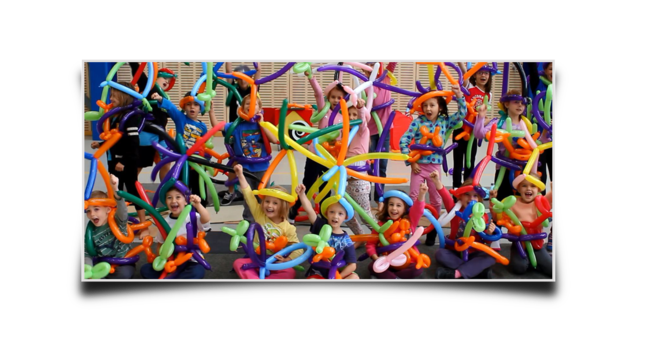 Look at the fun kids have while Silly Jilly twists balloons. In addition to creating balloons and laughs at Serendipity and Syberg’s Chesterfield, she also does her silly gags at other events where she does not have a long line. At birthday parties she often first makes guests a quick balloon hat and holds all the kids' attention as they laugh like crazy at her antics which is a great warm-up for her magic show. "She laughed so much she had tears in her eyes," wrote daycare teacher Diana about her student participating in Silly Jilly's show. 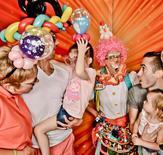 At events with over 100 kids people still love Silly Jilly's minute balloons. Clients of Silly Jilly's colleagues are sometimes required to sign a contract with a list of rules such as "No video taping," and, "No food served during show." Silly Jilly does not make you sign a contract. Also, your adult party guests may talk as much as they want during Silly Jilly's show. She brings a microphone so the kids can hear. The only rule Silly Jilly has is at events with over 100 kids she needs help ending her balloon line. If you would like a confirmation letter or text after booking, ask. Hire Kim to bring her commercial grade cotton candy machine and make yummy fun cotton candy. Notice there is no "we" on this page. 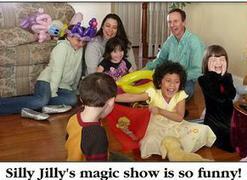 Book Silly Jilly, and she is who will be at your party, the entertainer with five star reviews. Also, if you confirm a few days before your party, be comfortable knowing you have confirmed with the entertainer. Everyone (with events in the same town minus some non-profits) pays the same price for a Silly Jilly party. This is one reason why her prices are listed on her website.